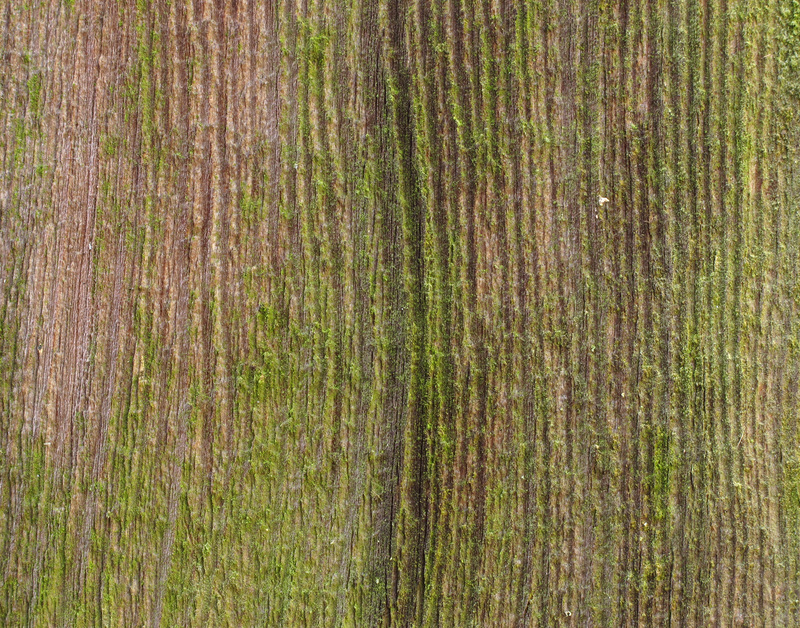 Two different mosses can be seen on this apple branch. Orthotrichum sp. is the erect one and the other going down the side of the branch is Homalothecium sp. Usnea sp. 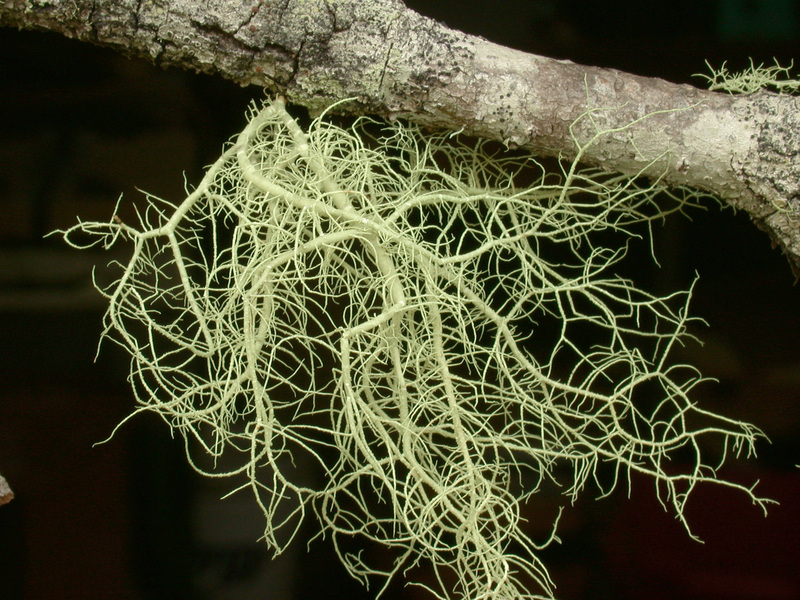 is a fruticose lichen. The foliose lichen on this apple branch is Parmelia sulcata. The crustose lichen, Phlyctis argena, on this apple branch is often mistaken for a disease. Unknown algae growing on the wood siding of this barn. Algae, lichens, and mosses grow profusely on trunks, limbs, and twigs of many trees and shrubs. The cool, cloudy, wet weather in western Washington and Oregon is ideal for these organisms. Algae are the simplest of green plants. They are present nearly everywhere and are numerous in almost any place that has sufficient moisture, such as on tree trunks and twigs, shrubs, soil, rocks, and walls, as well as in fresh and salt water. In large numbers, algae form the “scum” on ponds and wet areas of lawns. Lichens have two components—a fungus and an alga living in association with one another to give the appearance of a single plant. 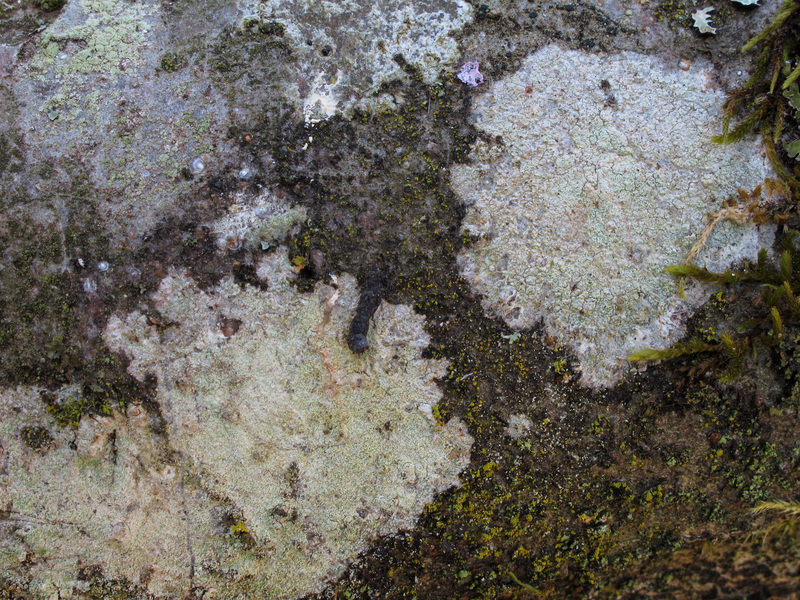 Lichens grow on soil, on trunks and branches of trees and shrubs, and on rocks. Rarely are they found in water. Like the algae, lichens manufacture their own food. They occur in several forms, such as crusty gray, green, yellow, and white growths. Some are leaf-like, others resemble a tuft of horse hair hanging from the branches. Mosses are green plants somewhat similar to algae except they have a complex structure that resembles stems and leaves. Because they contain chlorophyll, mosses can manufacture their own food. 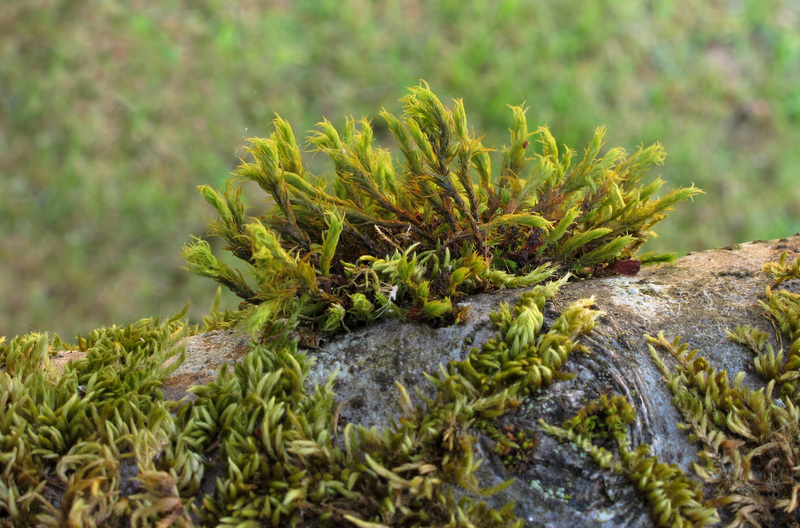 Mosses grow on soils, on tree trunks and branches, on rocks, and in water. Liverworts are closely related to the mosses and grow under similar conditions. All these primitive plants contain chlorophyll and make their own food, so they do not directly injure the plants on which they grow. Heavy growth, however, may have disadvantages for the commercial operator or homeowner. Some people like the hitchhiking plants as they add a bit of color to shrubbery and trees in winter. At times, however, the growth becomes objectionable or unsightly, and it is desirable to control it. Reduce conditions favorable for growth of these hitchhiking plants by opening up the plant canopy to allow better air circulation and light penetration. Pruning both shrubs and overstory trees may be necessary. Reduce plant numbers to open up the landscape. 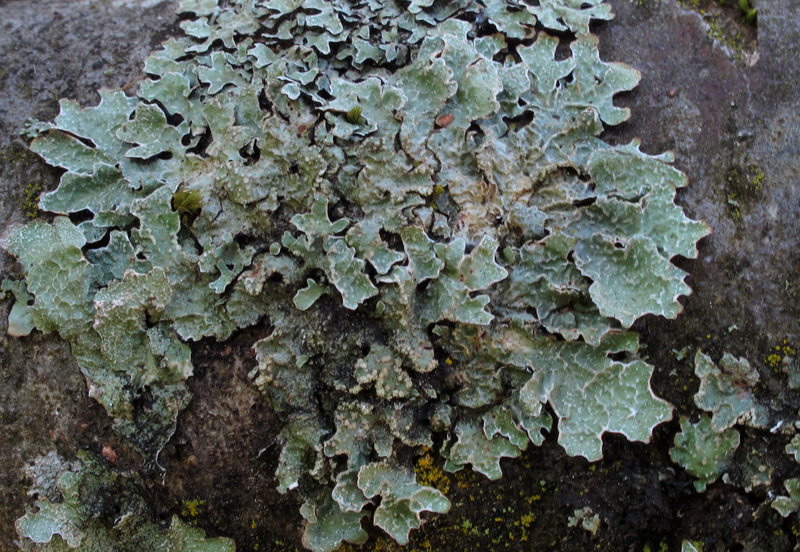 Algae, lichens, and moss often become established on slow-growing plants. Therefore, improve plant vigor by proper fertilization, watering, and cultural management. In moist, humid climates, these practices probably will not eliminate these epiphytic plants, but they will reduce their number and vigor. A number of fungicides not only will control fungus diseases but also will kill algae, moss, and lichens. The copper-based fungicides, mancozeb and lime sulfur, are examples. In order to use the fungicides, you must find the plant that you want to spray listed on one of these labels. Since the dormant season is a good time to apply sprays for algae, moss, and lichen control, follow the label directions for disease control during the dormant season. You will note that during the dormant season, these fungicides are used in higher concentrations, making them more effective. They should not be used at these concentrations during the growing season because they can injure the leaves. When using these sprays during the dormant season, be careful not to get them on evergreen plants nearby because leaves may be injured. Also, lime sulfur should be used carefully around painted structures because it can stain. One dormant spray should give adequate control. However, although the sprays may have effectively killed these growths, they will remain attached and visible for some time. Weathering and plant growth eventually will slough them off. The density of the original problem, the local environment, and the vigor of the plant will determine whether treatments are required each year. Those using organic growing practices will find some of the copper-based fungicides and lime sulfur sprays acceptable. Cultural controls should be used in conjunction with any spray program.